View details for thread pools statistics for a specific node or an entire cluster. Thread pool statistics are generally intended for tracking node rather than cluster activity. 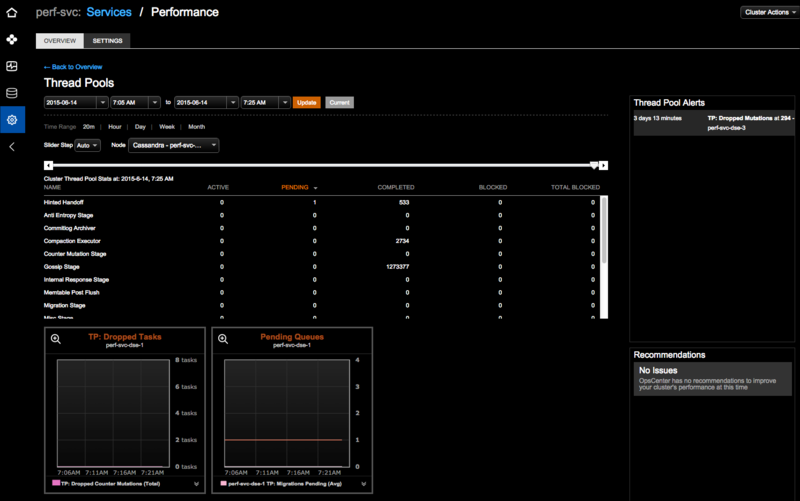 Thread pool alerts and any recommendations for improving cluster performance display in the respective panels. Specify the date and time range granularity to investigate the thread pool stats. The name of the thread pool statistic is displayed in the view, along with the Active, Pending, Completed, Blocked, and Total Blocked columns that indicate the counts for each queue. The Pending column is sortable in both the overview mini-panel and the main Thread Pools page. 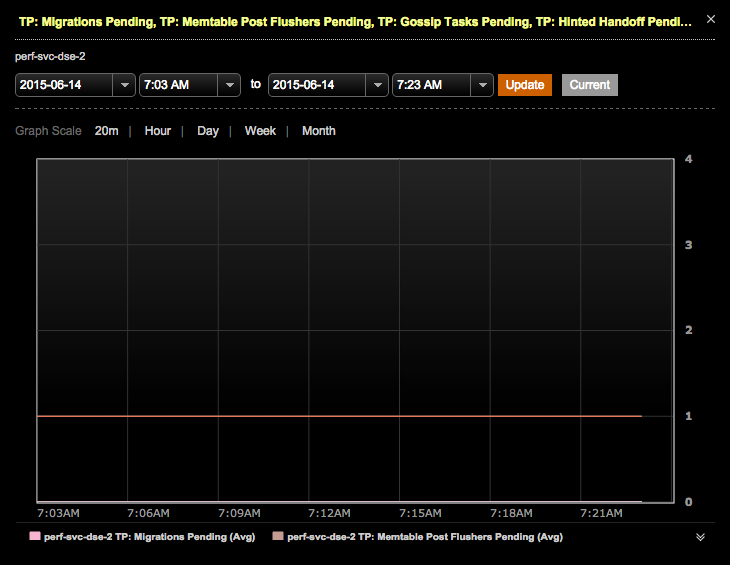 The Thread Pool Dropped Tasks and Pending Queues graphs provide a visualization of the metrics. Click the title bar of the Thread Pools panel. 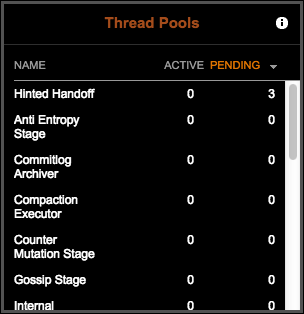 The Thread Pools performance details page appears. Date and time range for data: Select the date and time and click Update. Click Current to view real-time data. Time Range: Select the granularity for the data that displays in the thread pools statistics table. Available options are by 20 minutes, Hour, Day, Week, or Month. The selected granularity affects the view and the options available in the Slider Step list. Select the increment by which to move the slider bar for viewing the range of data over time from the Slider Step list. Click on the bar or drag to dynamically change the view of the statistics activities. Select either a cluster-wide view or a specific node from the Node list. Click the magnifier option in the metrics panels to view expanded details. Change the date and time range or the Graph Scale granularity.